California is known for epic kelp diving but the waters can be a bit chilly for tropical divers like myself. Looking for a quick summer dive trip close to home, I finally grew some skin and booked a trip with Truth Aquatics to the Channel Islands – my first truly temperate dive experience. My only regret…I shouldn’t have waited so long! Beneath the surface, kelp takes on a magical appearance. The gently swaying fronds create an undersea jungle of incredible beauty. Swimming through a dense kelp forest for the first time is like being on a safari, offering the promise of surprising animal encounters. Halfmoon (Medialuna californiensis) seek shelter in kelp forest. California sheephead (Semicossyphus pulcher). California. Halfmoon (Medialuna californiensis) seek shelter in kelp forest. California. California spiny lobster (Panulirus interruptus). California. Pyrosome at night. Pyrosomes are actually free-floating colonial tunicates made up of hundreds to thousands of individuals, known as zooids. California. Kelp bass (Paralabrax clathratus). California. Garibaldi (Hypsypops rubicundus) pair aerating their nest. California. Spotted scorpionfish (Scorpaena guttata). California. Juvenile Garibaldi (Hypsypops rubicundus). California. Blacksmith larval fish (Chromis punctipinnis) undergoing settlement; the crucial transition from pelagic, free-swmming larval stage to becoming benthic juveniles. California. Juvenile treefish (Sebastes serriceps). California. Blacksmith damselfish (Chromis punctipinni) jawning. California. Two juvenile California sheepheads (Semicossyphus pulchermales) "mouth fighting" over territory. California. Giant Kelpfish (Heterostichus rostratus). California. A diversity of fish and invertebrates inhabit the kelp forest bed as far as the eye can see. California. Juvenile giant kelpfish (Heterostichus rostratus) - still mostly transparent. Note the visible gut and air bladder. The young fish school in the kelp canopy and remain relatively transparent until they become solitary at about 3 inches. California. Juvenile kelp bass (Paralabrax clathratus). California. Adult kelp bass (Paralabrax clathratus). California. Giant Kelpfish (Heterostichus rostratus) can change color to match their surroundings. This individual was hiding in a bed of purple algae. California. 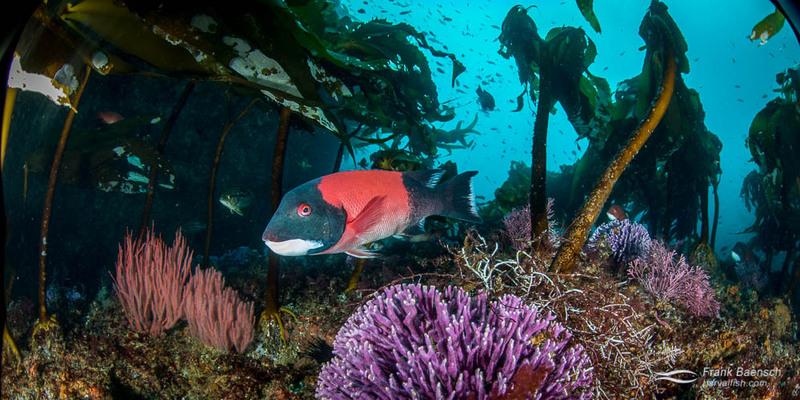 Garibaldi (Hypsypops rubicundus) in kelp forrest. California. Kelp rockfish (Sebastes atrovirens). California. Spawning senorita (Oxyjulis californica). I saw this species aggregate into large schools near drop offs during the midday and then spawn in smaller groups of 20-30 individuals. Senorita spawn from May through August. California. Giant Sea Bass (Sterolepis gigas). Note the large numbers of parasitic copepods attached to the head. California. Giant Sea Bass (Sterolepis gigas). California. Senorita (Oxyjulis californica) tends to schooling Halfmoon(Medialuna californiensis). The señorita is a cleaner wrasse, a fish that grooms the parasites and other materials off the bodies of other fish. California. Bluebanded goby (Lythrypnus dalli). California. Island kelpfish (Alloclinus holderi). California. Giant kelp frond (Macrocrystis integrifolia) showing pneumatocysts (air bladders). California.